THE RELUCTANT RADICAL will be shown in Holland at the Park Theatre on April 11 as part of the Macatawa Creation Care Education Outreach. Admission is FREE and a discussion panel will follow. Holland, MI - THE RELUCTANT RADICAL documentary will be shown at the Park Theatre as part of the Macatawa Creation Care Education Outreach, with FREE ADMISSION made possible by sponsors. The showing will be held on Thursday, April 11, at 7pm. Following the screenings, Steve Bouma-Prediger and Julie Ridl will participate in a guided discussion with the audience. 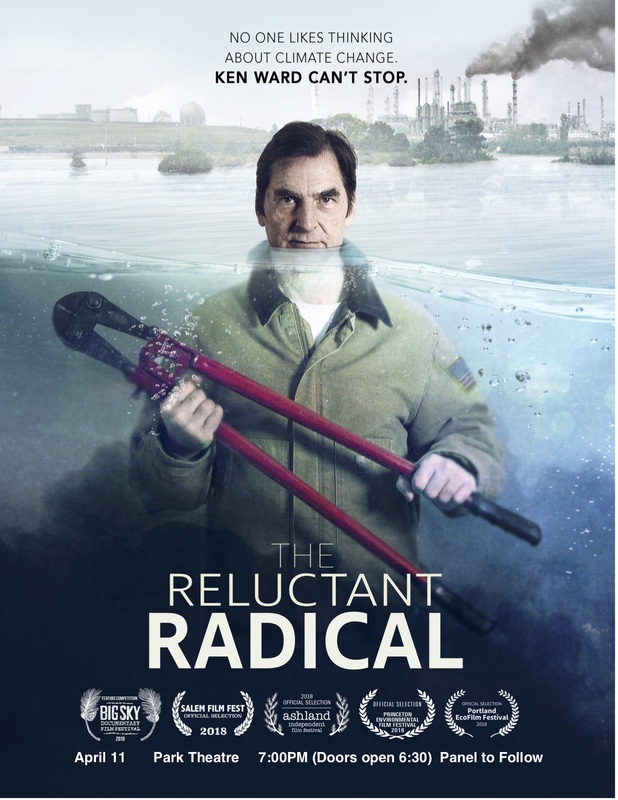 THE RELUCTANT RADICAL is a documentary film that follows activist and Oregon resident Ken Ward as he confronts his fears and puts himself in the direct path of the fossil fuel industry in an effort to combat climate change. The film reveals both the personal costs and also the fulfillment that comes from following one’s moral calling-- even if that means breaking the law. Audiences may not always agree with Ken’s actions, but his perspective and urgency promotes discussion and introspection about whether any of us are doing what is needed to avert the environmental catastrophe at our doorstep. THE RELUCTANT RADICAL follows Ken through a series of direct actions intended to stave off climate change, culminating with his participation in the coordinated action that shut down all the U.S. tar sands oil pipelines on October 11, 2016. As the resulting trial that threatens to put him behind bars for 20 years unfolds, we are asked to consider: If a crime is committed in order to prevent a greater crime, is it forgivable? Is it, in fact, necessary? Director Lindsey Grayzel was one of four independent filmmakers to be arrested and charged with crimes for filming the activists on October 11, 2016. The filmmakers’ arrests contributed to the alarm that press freedom and First Amendment rights have increasingly come under attack as law enforcement and prosecutors favor corporate fossil fuel interests over citizens’ rights. THE RELUCTANT RADICAL showing in Holland is presented as part of the Macatawa Creation Care Education Outreach, with support from Climate Witness Project and Milt and Marilee Nieruwsma.